A Cumbrian lighthouse has been officially reopened 99 years after it first came into operation. The cast-iron structure was built at the Hodbarrow iron ore mine near Millom, but has been out of use for more than half its life. The Hodbarrow lighthouse now has a new dome and lantern section, and is fitted with a solar-powered light. 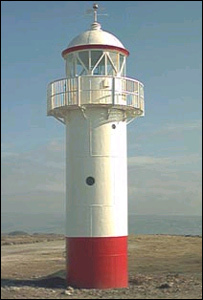 It has been adopted as Haverigg Primary School's logo and the pupils have been appointed honorary lighthouse keepers. Hodbarrow mine expanded its extraction out into the Irish Sea in 1905, and a new sea wall was built equipped with its own lighthouse, which could be seen 12 miles out to sea. But the lighthouse fell into decline along with the mine in the late 1940s. The restoration project, run by the Haverigg Lighthouse Committee, received £20,000 from the Heritage Lottery Fund.